One of the people that influenced my life several times through the radio shows that he did, is Willem de Ridder. It is too much to mention here now: Spannende Splookjes, the Radiola Improvisatie Salon, his talk radio shows and most of all his interviews with people who have deviant ideas about things and who were often ignored by the mean stream media. I still have a box with cassette tapes of some of the best shows that I have recorded over the years, and I still hope to meet people who have taped more than I did, so I can trade. Willem was deep into tapes, and he released many productions on cassette. Like the famous Spiral Tapes, that I have not mentioned yet in this Soundtrack, like 1001 other important things. Willem also made a few LP’s. All three LP’s that I have ( Doodsangst therapie is a double LP) are off spins of his radio shows. And all artwork for these LP’s is done by Peter Pontiac. 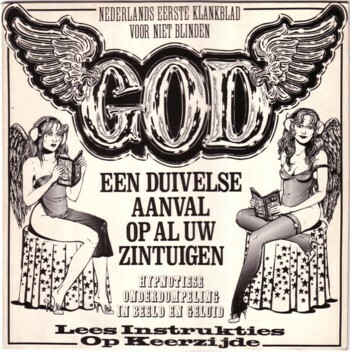 Peter did the artwork for many other Willem de Ridder projects too, but it seems that they don’t work together anymore. I must admit that I stopped listening to Willem when he began making radio for the Internet only. I only listen to podcasts; the idea that I can only listen to something on Thursday evenings at ten o’clock seems totally absurd to me now. I rather wait till these recordings show up as mp3’s somewhere. And I am sure they will one day. Among the many things that Willem de Ridder did, was improvising hearplays. He did that for the radio, often with listeners, and although it didn’t always work out, it was always exciting. And often it did work out wonderful. On the Doodsangst Therapie double LP, released by the radio station that Willem worked for at that time, the VPRO, are two horror stories, that caused quite a bit of commotion back then. The idea behind these hearplays was to comfront himself, and his audience, with his deepest fears. If you have never heard this, and if you speak Dutch, you can check out why here and here. The woman is played by Barbara de Vries, and remember, this improvisation was recorded in 1977! I would love to trade mp3s of these cassettes with ones from your collection. Let me know if you’re interested. Grappig toeval dat ik vanochtend op jouw site kwam, daarna op verzoek van mijn 4 jarige zoontje Dario op zoek ging naar meer platen van Willem de Ridder’s Spannende Splookjes, en weer bij jouw site terecht kwam. 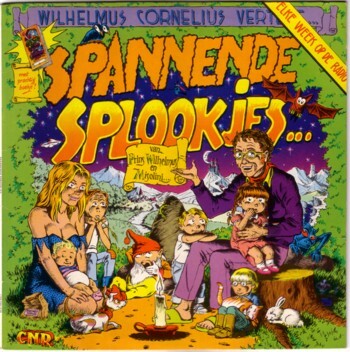 Maar ik vraag me dus af of jij weet of er behalve de afgebeelde plaat nog andere Spannende Splookjes platen zijn? Zag je strip in Eisner, erg mooi! Nee, volgens mij bestaan die splookjes alleen als cassetees. En die moest je dan zelf opnemen. Peter Pontiac tekende de hoesjes, die in de AVRO-bode werden afgedrukt. Ik heb ze helaas niet, die opnames. Maar die moeten toch te vinden zijn! Ik ga op zoek. 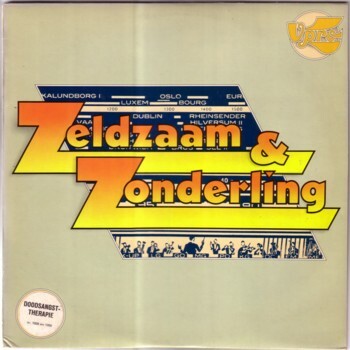 Ik heb ondertussen gezien dat de Splookjes op de site van willem de ridder te bestellen zijn op cd.